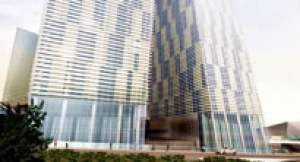 Veer Towers, CityCenter's most unique residential development, is a masterful translation of energy and excitement into physical form; its two 37 story glass towers shimmer day and night. Inclined at five degree angles a feature celebrated by the development's name the towers appear to dance with each other. Conceived by Architect Helmut Jahn, Veer Towers are meant to symbolize spirit and optimism with a strong iconic value; by leaning them they take the form of a sculpture. Lobbies and public spaces were developed by notable designer Francisco Gonzalez-Pulido to showcase impressive works of glass and metal with plenty of natural light. Circle of Life and Earth, two large-scale commissioned works by Richard Long, are on display at Veer Towers. Long's two mud wall drawings each measure approximately 80 feet high by 50 feet wide. Each tower houses approximately 335 modern condominium residences ranging from 500 to nearly 3,300 square feet. They include studio and deluxe studio layouts, as well as one, two and three bedroom flats or penthouses. Open floor plans feature floor-to-ceiling and wall-to-wall windows that capture spectacular views of Las Vegas and the surrounding CityCenter. Light-filled rooms, natural textures and a range of whites infuse streamlined interiors with openness. Modern kitchens, living and dining areas are ideal for entertaining and spacious spa-styled bathrooms invite retreat. High-end appliances and fixtures provide efficiency and sleekness as floor-to-ceiling windows showcase the Las Vegas vistas. Residences are filled with contemporary European-style features and designer-selected fixtures. Veer rises from Crystals, CityCenter's spectacular retail district, giving residents unprecedented access to the best of stylish, big city living. Upscale dining, lavish shopping, electric nightlife and entertainment are just steps away. Atop each striking tower, residents enjoy an amenities floor featuring an unequaled view of Las Vegas complemented by an infinity edge pool, hot tub, a sun deck and a patio for outdoor entertaining. Within, Veer features recreation rooms for special events or casual celebrations, private media rooms with panoramic windows, a fitness center with men's and women's steam rooms, and a business center.